making the concept of 'sustainable harvest level' somewhat questionable". At low tide the rocky shores flanking the mouth of the Bay of Fundy are draped with thick, tangled blankets of yellow-green, brown and purple seaweeds glistening damply in the warm sun. The incoming tide gently refloats this unruly mass, transforming it into a lush undersea "forest" that sways gracefully in the swirling currents. Like their counterparts on land, these marine "forests" provide food and refuge for large numbers of animals, as well as valuable cash crops for humans. For generations, dwellers on Fundy's shores have gathered and used several types of seaweeds. The purple Dulse (Palmeria palmata), collected by hand and dried in the sun, has long been a maritime delicacy. The purplish-red Irish moss (Chondrus crispus) is raked up in large quantities and a gelatinous material called "carrageenan" is extracted from it. This is used locally to make a tasty "seaweed pudding". It is also added to many processed foods, and other commercial products, to make them smooth, to keep them from separating and to control the growth of ice crystals during freezing. The most abundant seaweeds on these shores, however, are the rockweeds. This is a very general term for several different species of Fucus and Ascophyllum. 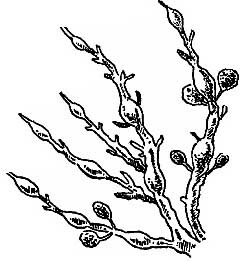 On the rocky Fundy coast, the dominant rockweed is Ascophyllum nodosum, or knotted wrack. It can grow up to 8 feet in length and live for 12-15 years. The plants are olive green in colour, with thick, leathery, branching stems or "fronds". They cling tightly to the rocks by sucker-like "holdfasts" that keep them from being washed away by the surging currents and crashing waves. The fronds have numerous air-filled "bladders" along their length , and these keep the plant floating upright in the water. The Nova Scotia Department of Fisheries (NSDF) considers the rockweed beds "a maritime treasure" that "provides the raw material for a profitable, growing and environmentally safe industry". Nova Scotia produces the largest amount of rockweed of all the maritime provinces, although the industry is expanding in New Brunswick. Rockweed is most abundant along the southwestern shore of Nova Scotia and around the mouth of the Bay of Fundy. Here, shallow, sloping shores, very high tides and coastal shoals and islands provide exceptionally wide intertidal areas where seaweeds can flourish. For centuries this rockweed was collected for use as an agricultural fertilizer, mulch and soil conditioner. Nowadays, the seaweed's growth-promoting compounds are extracted to produce a liquid "foliar feed" that can be sprayed directly on the crops. Thousands of tons of such extracts are produced annually in the region for export to more than 25 countries. Rockweed is also processed into kelp meal, a nutritious feed for livestock. Another important commercial use involves extracting gelatinous organic compounds called "alginates". These have similar properties to carrageenan, and serve as a stabilizer and thickener in thousands of commercial products ranging from paints, to cosmetics to puddings. Traditionally rockweeds have been harvested by hand, using either a sharp bladed knife at low tide, or from a small boat, using a long-handled rake with a cutting blade, when the tide is in. The harvest of a few tons of wet rockweed a day in this manner provided some fishermen with an important source of income in the off season. However, such small-scale, part time, seasonal harvests were not suited to the economics of the processing companies or the provincial government's ambitious plans for expansion of the industry. According to the NSDF "a revolution in rockweed harvesting came in 1985 with the introduction of the Norwegian Harvester". This large, motorized barge equipped with a vacuum device and cutter blades "is productive, harvesting up to 50 wet tons of rockweed per day". With this new technology the annual harvest in southwestern Nova Scotia increased sharply from less than 5000 tons to more than 27,000 tons. However, this peak harvest continued for only two years and fell to less than 20,000 tons per year by 1992. There followed a gradual phasing out of mechanical harvesters and in the past two years they have not been used in eastern Canada. The harvest, however, has been expanded into new areas. A permit was granted in 1995 for the collection of 10,000 tons of rockweed in southeastern New Brunswick. This three year pilot project will produce about 80 jobs. According to the Federal Minister of Fisheries "monitoring the rockweed harvesting will be critical to ensure that our conservation objectives to protect the marine environment are not compromised". In both NS and NB the resource is now managed by limiting the number of harvesting permits, regulating the techniques used and specifying the total quantity of rockweed that can be removed from a given area. Regulations also specify that the rockweed must be cut a certain distance above the base, leaving enough of the plant to permit recovery within a few years. Once an area is harvested, it is closed to cropping for 2-5 yeas to allow recovery of the beds, a management strategy referred to as "pulse harvesting". The NSDF feels that the result is "a profitable, growing and environmentally safe industry" that will "continue as a Nova Scotia industry for future generations". However, some marine scientists, and environmental groups such as the Conservation Council of New Brunswick (CCNB), are not convinced that enough is known about the long-term ecological impacts of the harvest. They also question whether current management strategies are adequate to protect the resource. The CCNB maintains that " we need a full public environmental impact assessment", and until that is done "large scale commercial harvesting of rockweed should be prohibited". Inka Milewski of the CCNB worries that current harvest management "sounds much like clearcutting of our forest resources". 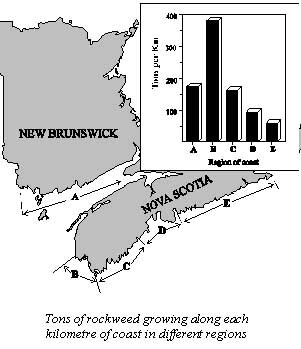 There seems little doubt that the rockweed resources in Nova Scotia were poorly managed in the past. Even government scientists acknowledged that there were "problems with overharvesting" in many areas. New management strategies and monitoring programs have since been developed in both provinces. Only time will tell whether these will be sufficient to protect the rockweed beds and ensure a sustainable harvest. Rockweed is indeed a "maritime treasure", but not simply because it is a profitable source of agricultural and industrial raw materials. In the headlong rush to expand the harvest, the fact that rockweed is an important living part of coastal ecosystems has too often been ignored. More than a century ago Charles Darwin noted that "a rocky and partially protected shore perhaps supports in a given space a greater number of individual animals" than other marine regions". The rockweed beds of the Fundy coast are rich in marine life. The cool, wet, protective blanket of vegetation left when the tide goes out, prevents the intertidal animals from drying out or baking in the hot sun. Many species of fish, seabirds and invertebrates also depend on these rockweed "forests" for food and for refuge from hungry predators. Few animals eat the healthy, adult rockweed plants. However, many invertebrates, such as urchins, periwinkles and amphipods, feed on the young plants, fragments that continually break off, as well as on the mucous, bacteria and epiphytes (smaller attached plants) found on the rockweed fronds. These vegetarians (herbivores) are themselves much sought after by fish, seabirds and and other hungry carnivores that forage among the fronds. At least 30 species of fish, 15 species of birds and scores of different invertebrates use the rockweed beds at some point in their life cycle. The beds seem to be a critical nursery area for many species of fish, including several commercially important ones such as pollock, herring and flounder. For instance, in early May young pollock, only a few centimetres in length, move shoreward to forage in the seaweed "forest" as the tide rises, and retreat seaward as it falls. They eat the abundant small animals hiding amongst the rockweeds and grow rapidly. Seabirds also forage in the rockweed, seeking these small fish. Without the "forest" to shelter them, many more would be captured. Two years later, when they are about 30 centimetres long, they move off into deeper water to begin their adult life. Seabirds and waterfowl are also attracted by the other prey available amongst the rockweed throughout the year. In spring black and eider ducks, with their young, forage intently, the ducklings largely feeding on amphipods and the adults on periwinkles. Some scientists feel that the survival and growth of eider ducklings is largely dependent on this rockweed nursery. Many other ducks such as buffleheads, goldeneye, oldsquaw, whitewing, surf scoters and greater scaup also frequent these areas during the winter when food elsewhere is scarce. Even after they are torn loose from their rocky beds by the storms of autumn and winter, rockweed plants continue to be valuable in the marine environment. The still living, photosynthesizing fronds accumulate in large floating rafts that drift with the currents. This jumble of vegetation teems with small marine animals seeking food and refuge, including larval lobsters and fish. These in turn attract seabirds such as phalaropes and terns, as well as larger fish. After drifting for weeks or months, the rafts wash ashore and pile up in long windrows at the high tide mark. Sandflies, beach fleas, bacteria and fungi thrive in the dying vegetable matter. They slowly decompose this natural compost heap into a brownish sludge, rich in fertilizing nutrients. The decaying mass may be refloated by subsequent high tides, drifting elsewhere to strand and rot, again and again until it finally disappears. The small particles formed during decomposition are an important food for bottom dwelling animals. The soluble material is a potent fertilizer that stimulates the production of phytoplankton and other marine plants. Recent studies also suggest that some of the colloidal organic compounds produced may be eaten by adult and larval scallops. This brief review of rockweed's role in the sea supports the contention of Bob Rangeley, from the Huntsman Marine Laboratory in St. Andrews, New Brunswick, that "the extant biomass of rockweed is an essential component of the ecosystem". He also points out, that in collecting rockweed we are in fact harvesting a valuable coastal habitat, making the concept of "sustainable harvest level" somewhat questionable. Any level of harvesting will inevitably diminish this habitat and have an impact on the animals that live there. The difficulty lies in deciding what level of environmental impact we are willing to accept in return for the many useful products that come from rockweed. We may eventually learn to develop and manage this industry in a sustainable, environmentally acceptable manner. However, to do this successfully, we need to have a much better understanding of what frequent cutting does to the seaweed beds. Perhaps more importantly, we need to learn a lot more about the consequences for the many other species that dwell in these productive marine "forests". We must be very careful not to squander either our "maritime treasure" or our unquestionably more valuable "ecological treasure". Rockweed: A Nova Scotia Treasure [Video; 8.5 mins]. Nova Scotia Department of Fisheries, Halifax N.S. Floating algal rafts and their associated fauna in Passamaquoddy Bay, New Brunswick. G.J. Parsons, M.Sc. Thesis Acadia University, Wolfville N.S. 1986. Ecological impact of marine plant harvesting in Northwest Atlantic: a review. G.J. Sharp and J.D. Pringle, Hydrobiologia Volume 204/205 pages 17-24. 1990. An assessment of Ascophyllum nodosum harvesting methods in Southwestern Nova Scotia. G.J. Sharp, Canadian Technical Report of Fisheries and Aquatic Science Number 1012. 1981. Use of rocky intertidal habitats by juvenile pollock Pollachius virens. R.W. Rangeley and D.L. Kramer, Marine Ecology Progress Series. Volume 126 pages 9-17. 1995. The Bay of Fundy Ecosystem Project is supported by Environment Canada, the Department of Fisheries and Oceans Canada and the Acadia Centre for Estuarine Research. This publication is financially supported by the Gulf of Maine Council on the Marine Environment. It may be reproduced with credit to the Clean Annapolis River Project.